It is not a secret that every woman is dreaming of long, thick lashes which will emphasize the beauty of the eyes and make the look expressive. Fortunately , with the newest eyelashes treatment this dreams may come true , as not all of us were lucky to be born with naturally perfect eyelashes. Tian Permanent makeup Studio in New York presents the newest treatment for eyelashes – Lash Lift. Lash Lift is a treatment for long , luscious lashes. This is not the same as eyelash extensions, though this treatment offers permanent results. 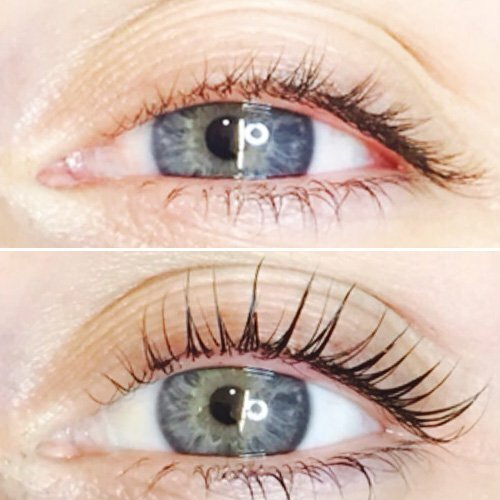 Lash Lift is an advanced technique that gives lashes dark, full and curly look for several months without a need of a touch-up. After the treatment eyes will look bigger and wide open without any makeup. This procedure also offers you to choose the degree of curl, from C to J. Usually, your technician will help to make a decision by the look of your natural lashes. The procedure usually take no longer than 45 min from beginning to end. Though, be ready to have your eyes close the entire time. Yumi lashes last as long as your natural lashes life cycle.This period can vary from person to person .In general, it may last up to 4 months. Tian Studio is offering lash lifting using Yumi lashes. Yes, this treatment is perfectly safe. It is a perfect alternative to false lashes, because it enhances the beauty of your own eyelashes. Yumi lashes is high quality product was developed in France. Yumi lash technology using no chemicals like lash perm or extensions. Instead, it fills your eyelashes with keratin which will strengthen your lashes with each lift. Yumi lashes is different from other products because it is the only one that uses Keratin formula. * Not tested on animals, gluten-free. Get lashes wet. This is very important!!! Can I use lash curler? There is no need to use curler as Lash Lift will give you a perfect lift. Besides, using curler may damage your eyelashes. Yes. However, many women prefer not to use any cosmetic products on the eyes because the effect from Yumi lash lift is enough to emphasize the eyes. Not mentioning ,that Yumi lashes offers a wide range of tints that will compliment your look perfectly. Why should I choose lash lift over mascara? Lash Lift is a great alternative to mascara due to saving time and money .Besides, everyday use of the mascara and makeup remover slightly harm your natural lashes, causes it to break and become thinner. After only one session of Lash Lift you may forget of grooming your eyelashes on a daily basis for months, which is an incredible solution for a busy women in the modern world.